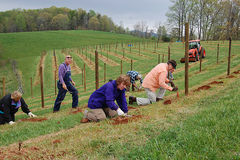 MILLS RIVER, NC — Western North Carolina farmers received $148,500 in WNC Agricultural Options grants to diversify their farm businesses in the 2013 growing season. The 28 grant recipients celebrated Tuesday at an event at the Mountain Horticultural Crops Research and Extension Center in Mills River. The goal of the farms’ projects is to enhance profitability. Six farm businesses received $3,000, one received $4,500, and 21 received $6,000. Many of the farmers are undertaking projects that are unique to their counties, and some are leading the way in innovative agriculture nationwide. 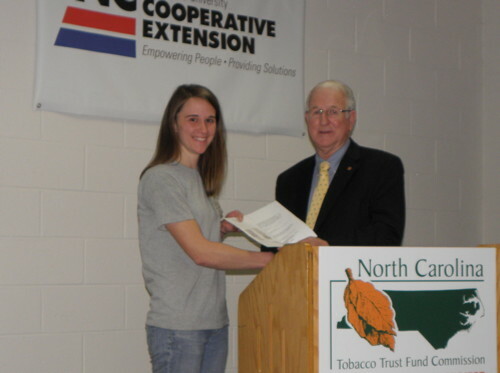 Bill Teague of Leicester, Chairman of N.C. Tobacco Trust Fund Commission, awards Jessica Lawrence of Tester Dairy Farm in Watauga County a grant to start a hydroponic fodder system. South Valley Nursery and Landscaping in Avery County is building a micropropagation lab so that grant recipient Tyler Buchanan can mass produce unique plants such as native orchids that are expensive to propagate using traditional techniques. Tissue culture requires a significant upfront investment, specialized training and a sterile environment to be able to produce new plants in vitro (in a test tube), but payoff can be significant since the demand for these rare native plants is high. Joe Ward in Jackson County is establishing a no-till planting system in an area where few farmers use this method. In no-till fields, soil erosion and runoff decrease as a network of fibrous and tap roots grow throughout the soil profile, providing pathways for air and moisture. This method also creates a good environment for earthworms and beneficial bacteria, fungi and enzymes, all crucial for healthy crops. In partnership with N.C. Cooperative Extension, the non-profit organization WNC Communities administers WNC AgOptions grants. WNC Communities is dedicated to providing a unique forum for leaders in western North Carolina to carry out innovative programs to improve the quality of life for rural communities and to enhance the agriculture economy. Members of the WNC AgOptions steering committee include: representatives from N.C. 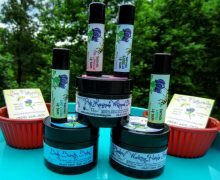 Cooperative Extension, WNC Communities, N.C. Department of Agriculture & Consumer Services–Marketing Division, Appalachian Sustainable Agriculture Project and other leaders in agriculture. For more information, see the following: WNC Agricultural Options: www.wncagoptions.org; N.C. Cooperative Extension Centers: www.ces.ncsu.edu; N.C. Tobacco Trust Fund Commission: www.tobaccotrustfund.org; WNC Communities: www.wnccommunities.org. View the full list of 2013 WNC AgOptions recipients.